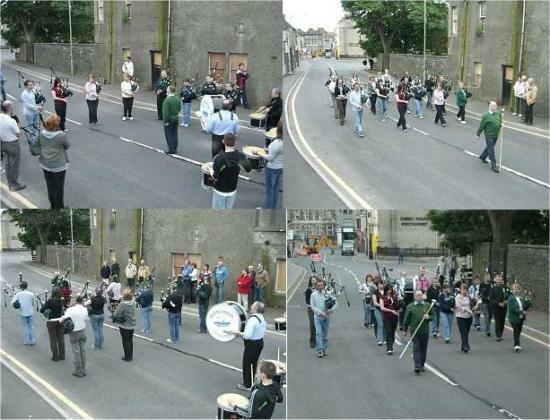 Wick RBLS Pipe Band took advantage of the roadworks which caused the overnight closure of High Street outside the Pipe Band Hall to hold a practice prior to their visit to Germany. The practice provided an unexpected treat for a large group of German tourists staying overnight in the town. The band is off to Germany next Wednesday night to visit their friends in the Bad Waldsee Pipe Band. The main event of their visit will be an International Tattoo featuring pipe bands and brass bands from Germany, Austria and Switzerland, the Wick band will be the only one from Scotland. In addition to the Tattoo the band will also be playing at other venues including a beer mug museum. The Wick band has a long association with the Highland Pipes and Drums of Waldsee and this will be the third time that the full band has visited southern Germany but there have also been a number of individual visits by band members. The German band has also made 3 official visits to Wick plus a number of informal visits. Pipe Band Secretary John Bogle said " The band members are excited about returning to Bad Waldsee, it is a very beautiful part of Germany and we are always made very welcome by our hosts. It is a long journey to get there and the travel is very expensive, however, we are keen to maintain our links with the Bad Waldsee band which were established a number of years ago by senior band members who are sadly no longer with us". JUNE Saturday 11th Wick Harbour Day. Saturday 11th 8pm Gordon Gunn with Brian McAlpine and Marc Clement, Pipe Band Hall, High Street, Wick. Massed pipe bands from Caithness in the Market Square, Wick on Saturday 18th July 2015. Massed Pipe Bands in Wick's Market Square, Caithness. Recorded on 16th September 2006. As part of this year's Blas Festival, Wick's Assembly Rooms will be rocking to the distinctive sound of the Red Hot Chilli Pipers on Saturday 6th September. However many fans will be disappointed as the concert is now completely sold out. Mr Boom will land the Space Ship Imagination at the Wick Pipe Band Hall. Fun for younger bairns at Wick Pipe Band Hall. The Wick Pipe Band Hall will be the venue for a traditional music concert on Saturday 14th December 2013 starting at 7.30pm. The concert will feature the well known musician Carol-Anne MacKay along with some of the musician friends she has met along the way and some of her pupils. Thursday 8th August 2012. - The centre of Wick will resound to the skirl of the pipes as Wick RBLS Pipe Band is joined in the Market Square by the Happy Pipers from Lucerne in Switzerland. The winners of last Saturday's BBC1 programme "When Will I Be Famous", the Red Hot Chilli Pipers have agreed to play at a Massed Pipe Band event in Wick in September. The live TV show is hosted by Graham Norton and each week 8 different acts compete for a �10,000 first prize. (Written in 1994 to mark the Band's 75th Anniversary) Since the band was first formed in 1919, we seem to have been a band of several names, several uniforms, and many ups and downs. We have had internal battles, external battles, special meetings, extraordinary meetings, promises and threats, not to mention dramas, which led to fall out and decline.